This function allows USB connection with your digital audio player, or other USB Mass Storage Class device, via a dedicated terminal - a direct connection without using a PC. 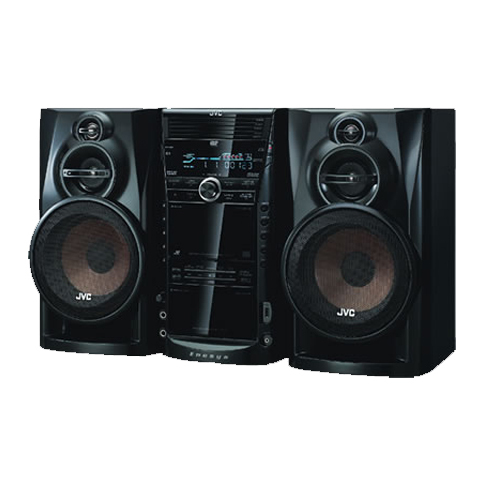 You can enjoy MP3 or WMA music files through the system's speakers with better sound quality, and with all digital signal transmission that has no conversion loss. Have fun with karaoke at home! The DX series features two MIC inputs, MIC level control, vocal masking, digital echo, and digital key control to give you an enhanced singing experience. The units also have Karaoke Scoring Function, which gives a score and a comment for each performance, accompanied by fanfare and applause. It even displays your calorie consumption. Different bass for different tastes. Choose the bass that most fits you. Vario Bass offers four types of bass to fit your various needs; 'TURBO' for an overall boost, 'TECHNO' for fast, aggressive bass which is also suited for tape/tuner sources, 'MOVIE' for a strong deep bass suited to movies, and 'LITE'N EASY' for a mild bass, ideal for karaoke.